Edward (Ted) Haggar Barlow, was born on the 15th June 1929 and grew up in Morecombe. He later attended Lancaster Grammar School and then went on to Manchester University, where he read civil engineering. After graduating, Ted was called up for National Service and was fortunate enough to receive a commission in the RAF, spending two years constructing and maintaining airfields, in Germany. Returning back home to Newquay, where his parents had brought the Kilbirnie Hotel, Ted met Barbara whom he married in 1954, they have three sons. After postgraduate studies, Ted completed his professional qualifications; A.M.I.C.E and A.M.I.M.U.N.E and enjoyed a successful career as a civil engineer for many years, before his father suffered a serious heart attack. Ted and his wife agreed they should put his career on hold, so they moved to Newquay to help run the family hotel, until his father recovered. Having enjoyed the taste of hotelier life in Cornwall he was in two minds what to do next. Ted started to look for jobs back in civil engineering, until through a series of coincidences and good luck, they managed to buy their own hotel, the Treglos, borrowing all the money to do so. It was a great time for country house hotels and soon their sons joined the business. With the help of their sons, ambition and drive, the business soon expanded to four hotels. As well as being a successful hotelier for over five decades, Ted has always loved sport and was successful in swimming and rugby. When in the Sea Cadets aged fourteen, he became the national 100 yards freestyle champion and later obtained his university colours for swimming and water polo. He also enjoyed a strong passion for rugby, he played for twenty-three years at school, university and a number of other clubs. Before deciding to retire from the sport, he represented Wiltshire and the combined counties of Dorset and Wiltshire. After moving back to Cornwall, Ted pursued a number of interests including golf and sailing both of which he stills enjoys today. Last year he even won a golf tournament at the Budock Vean Hotel, completing a full round of 18 holes, in three less than his age. Ted was also a very keen pilot for twenty-five years and would often be seen flying in and out of Bodmin Airfield. Last year, with his son Jim, he bought a new yacht, which is now moored in Mylor Yacht Club. Ted is a very experienced yachtsman and has completed a number of voyages over the years, the highlight of which was competing in the RORC Atlantic Race in 1981 in his own boat, with his sons Jim and Chris, amongst a crew of five. Ted is also a keen bridge player and a member of the Falmouth club. In addition, Ted has always been very active in his local community, as well being part of our Masonic Fraternity for many years. He has also been a long-standing member of Padstow Rotary Club, which he helped to found in the 1970’s and of which he was their 3rd President. Ted’s indomitable fighting spirit helped him overcome throat cancer in 2008. Very sadly though, in the early part of 2017 and after 63 blissful and wonderful years together, Ted sadly, lost his wife Barbara. Today Ted lives at the Budock Vean Hotel, run by his son Martin, where he continues to enjoy playing bridge, sailing and golf. He is a great family man and enjoys nothing better than spending time with his granddaughters Emily, Sarah, Hannah and Molly, taking great pride in their achievements which included Emily gaining a blue at Oxford. He is looking forward to skiing with Molly on the slopes of Chamonix during the forthcoming half term holidays in February. In June this year, Ted will be celebrating his 90th birthday. Ted’s long association with Cornish Freemasonry began on the 4th February 1969 when he was Initiated into St. Petroc Lodge by the then Worshipful Master, Worshipful Brother W. Davidson. Exactly 50 years ago to the night of this special celebration, he progressed to becoming a Master Mason. By 1971 Ted had progressed onto the Stewards list and to Assistant Secretary in 1973. He further progressed up the List of Lodge Officers and was appointed Junior Warden in 1975, Senior Wardenfollowed in 1976. The following year he was installed into the chair of King Solomon and became Worshipful Master on the 6th December 1977. In 1978, the 100th year of St. Petroc Lodge, he installed his successor Worshipful Brother M.J. Reed, who had followed him throughout his Masonic career. Ted has been a loyal and committed member of his Lodge and has held the office of Chaplain from 1999 to 2010. He was the Charity Steward on two occasions, in 2005 for a year and then ten years later in 2015 for a year. Ted’s Masonic career developed further in 1983 when he was appointed Past Provincial Senior Grand Deacon, in 1990 he was promoted to Provincial Senior Grand Warden for the Province of Cornwall. Later again in 1999, he received the high esteem of being promoted to the rank a Grand Officer, the Grand Rank he received was that of Past Assistant Grand Director of Ceremonies. Outside of his own Lodge he was also a member of the Cornish Masters Lodge and Eagle Lodge where he was their Almoner in 1992, for five years. To this day he is still a member of the Cornish Links Lodge and was their Worshipful Master in 2001. Ted’s Masonic career has not been confined to Craft Masonry as has also joined the Holy Royal Arch and became a member of St.Gwethnoc Chapter in December 1974. He became Most Excellent Zebrubbabel, in 1982. He was further promoted to Past Provincial Grand Scribe Nehemiah, in 1992. From this magnificent record it can be seen that Ted served his own Lodge and Cornish Masonry with great distinction and loyalty throughout his 50 years of service. He is a great ambassador to the cause and is always willing to help out and to share his expertise. Worshipful Brother Ted is a very proud Cornish Freemason who has enjoyed a long and varied Masonic Pathway. A journey that he still continues to enjoy each and every day and long may this continue. Once again a very special evening enjoyed by all those Brethren lucky enough to attend and certainly another moment in history for Cornish Freemasonry. 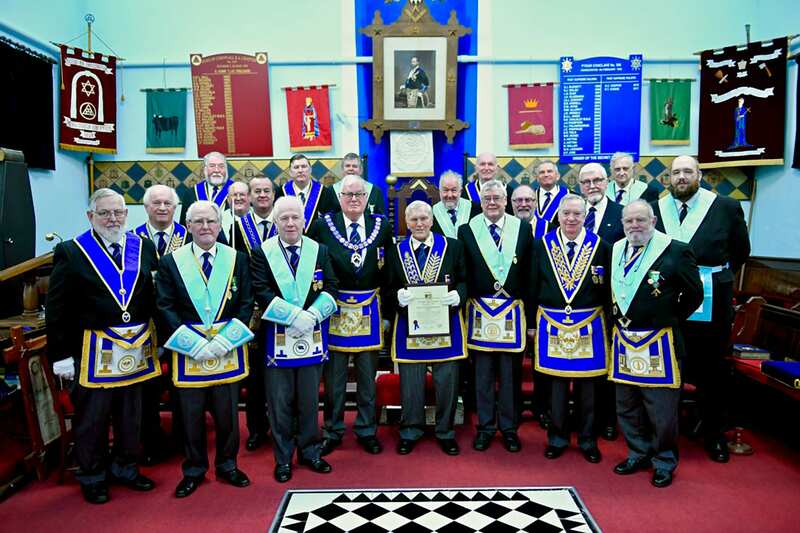 Like many other Lodges in the Province of Cornwall, St. Petroc Lodge are extremely lucky to have such an active and loyal member within their ranks. Worshipful Brother Ted, without any question of doubt you richly deserve your 50 year certificate and evening of celebrations. Like several of those other remarkable men who have recently celebrated 50 and 60 years of service to Freemasonry, you are an inspiration for all Freemasons throughout Cornwall and beyond. The Brethren of St. Petroc Lodge together with the members of the Province of Cornwall are honoured to have you amongst their ranks. Sincere thanks 🙏 also to Worshipful Brother Simon Copas for assisting with the history of Worshipful Brother Ted, great Teamwork once again, to create a lasting memory for the Province of Cornwall.